The clutch disc enables smooth start up and a quick change of the gears. Between the fly wheel and the pressure plate, it separates and connects the engine and power train. 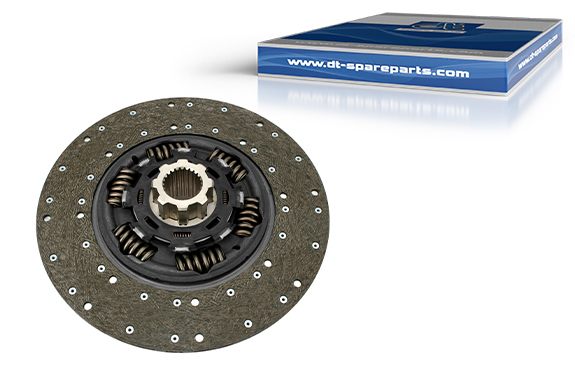 The 2.30299 clutch disc from DT Spare Parts is equipped with a high-quality friction lining on both sides, which is riveted onto a carrier plate. The lining that is used meets the latest environmental standards and ensures an optimum balance between performance and service life. The suspension ensures a trouble-free build-up of torque during start-up and even wear on the lining. The six torsion springs used reduce the speed and torque fluctuations of the engine. This additionally reduces noise and wear in the transmission. When inserting the clutch disc, it is important to ensure that it is optimally aligned with the engine and centred in the flywheel by means of a mounting mandrel. The hub profiles should always be lubricated so that they can be moved easily on the transmission shaft. The linings must be free of lubricant in order to prevent slipping of the clutch. In various vehicles, the clutch must be put into operation following installation by means of a break-in procedure. This is done in order to ensure optimum function. The wear values must also be reset in some vehicle types in order to understand the extent of the clutch wear.